These Chocolate Biscuit Bombs are like the best chocolate danish ever! Only 2 ingredients, they bake up fast; they’re the perfect brunch or dessert recipe. If you’re like me and always over buy biscuit dough then THIS is the perfect way to use it up. They’re perfect with a side of bacon for breakfast or a side of ice cream as a dessert. Plus: chocolate. Have you ever opened your fridge and realized you have extra cans of biscuits or crescent rolls or pizza dough? Or is that just me? I’ll often find them on sale and think I’ll make a new recipe (like Crescent Roll Churros or Pull-Apart Bread) but then they often get buried in my fridge and I forget about them until they’re almost expired. Then, I’ll be digging for something and find a can and have to put my mind to work to come up with a recipe idea. This time I decided to go full on sweet brunch recipe and add CHOCOLATE. When you stuff biscuits with chocolate and cover them with glaze, they taste a lot like a decadent breakfast pastry. While I wouldn’t condone this for a regular breakfast, it’s perfect for a special occasion or Sunday brunch. Or, if you’re like me, it’s DESSERT! The chocolate gets all melty inside the biscuit, making these bombs a chocolate lovers dream. Then, I thought about my friend Holly’s Garlic Cheese Bombs. Cheese bombs are a cult thing, I guess. I’ve never made them, but they’re all over the internet and the Pillsbury website. 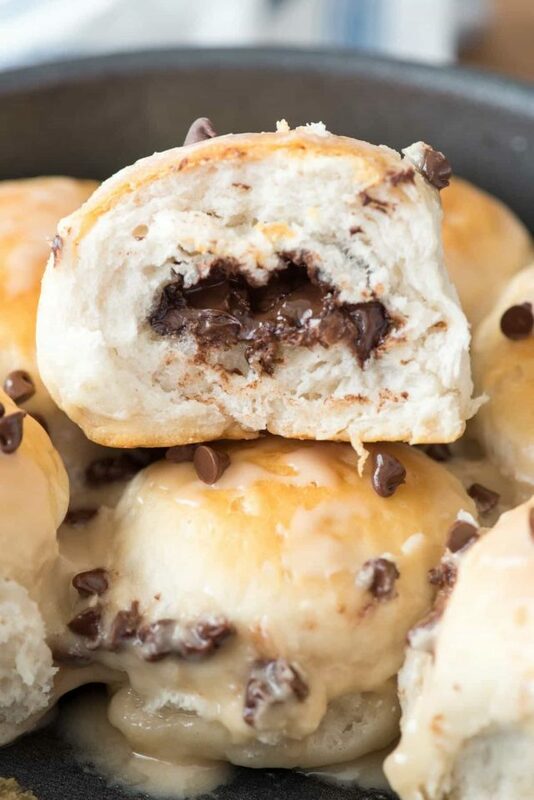 Cheese bombs, meatball bombs, pizza bombs….now we can add Chocolate BISCUIT Bombs to that list. Or we’ll just redefine what a chocolate bomb is. Or coin a new phrase: breakfast biscuit bombs! Chocolate Biscuit Bombs are the perfect brunch or dessert recipe! With only 2-ingredients, these biscuits bake up fast and add a sweet start to your morning. If you’re looking for an EASY 2-ingredient recipe, this is it. The glaze adds a few more ingredients but really, it’s not required; it just looks prettier in the photos. These are like a cheater recipe for a chocolate croissant without all the work of making croissant dough. 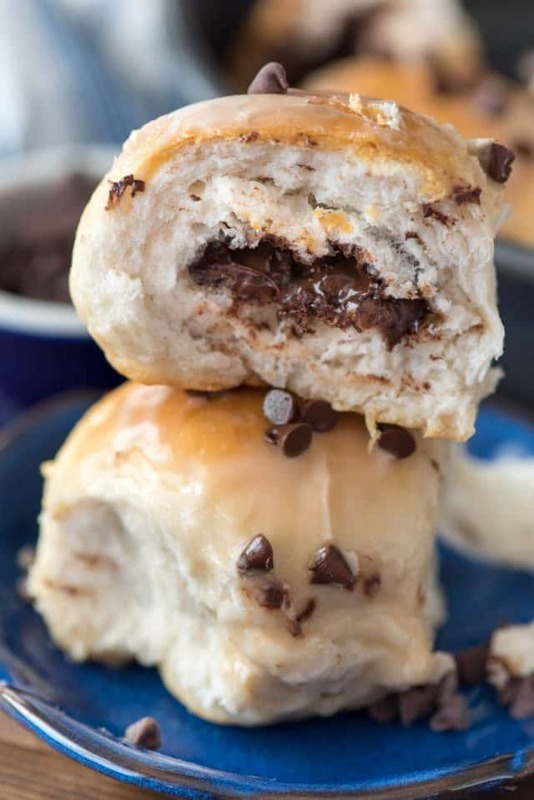 Easy chocolate croissants with Pillsbury dough that are much more bread-like, that is. And honestly, more bread is my friend. Basically you should add this easy breakfast recipe to your repertoire because it’s so easy it’ll come together in minutes for Sunday brunch. If you’re anything like me, minutes for breakfast is a requirement for most recipes. I used Grands! 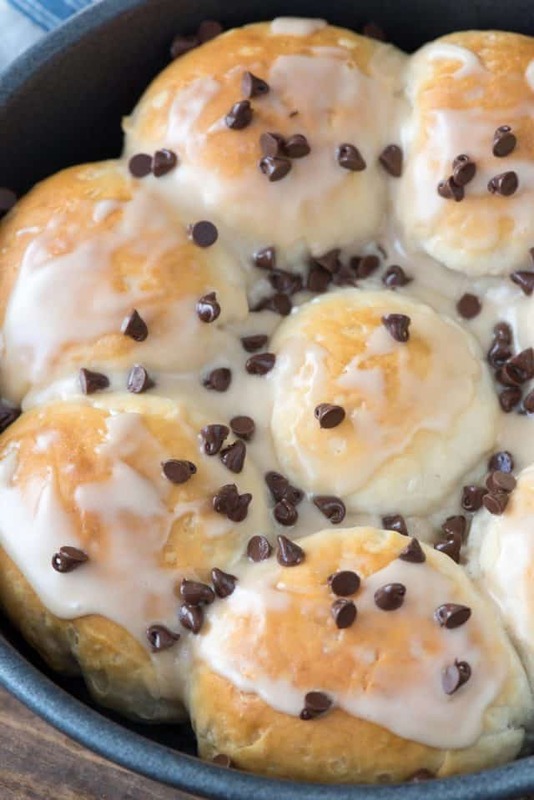 biscuits, but you can use any kind of biscuit dough or even crescent roll dough for this recipe. I think my 45 minute dinner rolls or potato rolls would work perfectly with this recipe too, if you want to go the homemade route. Chocolate chips, Nutella, or any kind of candy or chocolate would work perfectly for these. The glaze is optional, but it sure is pretty! Chocolate for breakfast, where do I sign up?? These Chocolate Biscuit Bombs are like the best chocolate danish ever! Only 2 ingredients, they bake up fast; they're the perfect brunch or dessert recipe. Unroll biscuits. 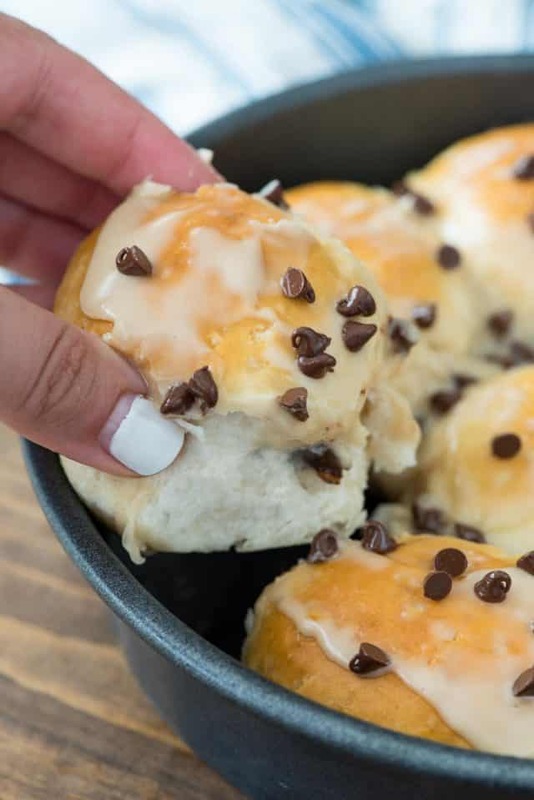 Place about 2 tablespoons of chocolate chips in the center and roll up the biscuit to conceal. Place in prepared pan. Bake 12-18 minutes, or until golden brown. Cool at least 10 minutes before icing and/or serving. To make icing: whisk powdered sugar, vanilla, and enough cream to make it a pourable consistency. I love so many brunch recipes! Be sure to check out Amy’s Chocolate Braid or Gerry’s Apricot Danish Braid. If you love biscuit bombs, be sure to check out all of Holly’s. She’s got several, including Garlic Cheddar! 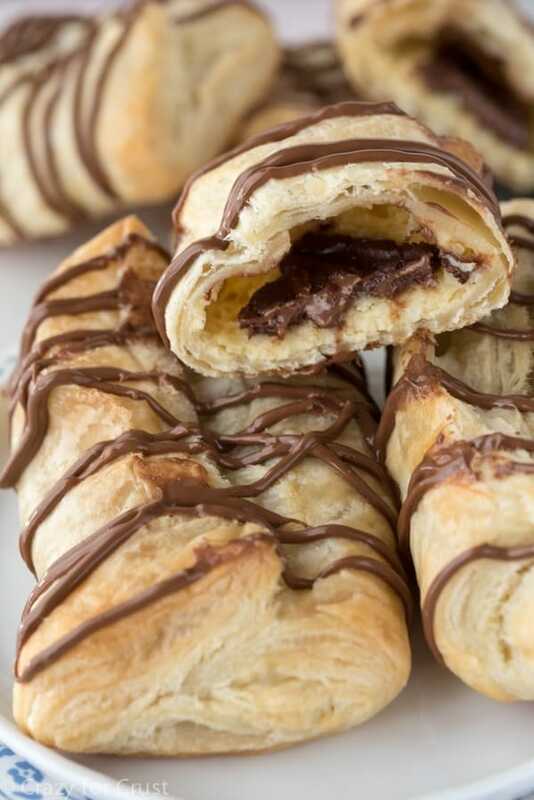 My chocolate cheese danish are also perfect for brunch! 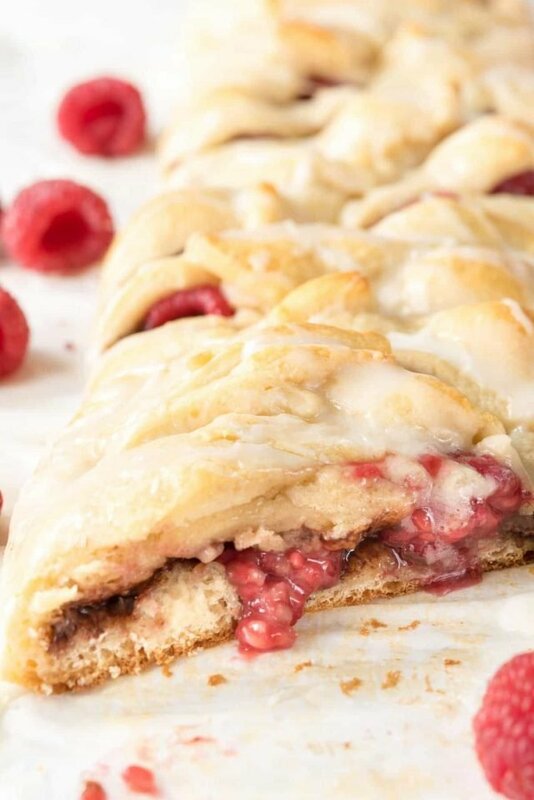 Raspberry Nutella Braid is perfect for chocolate lovers. 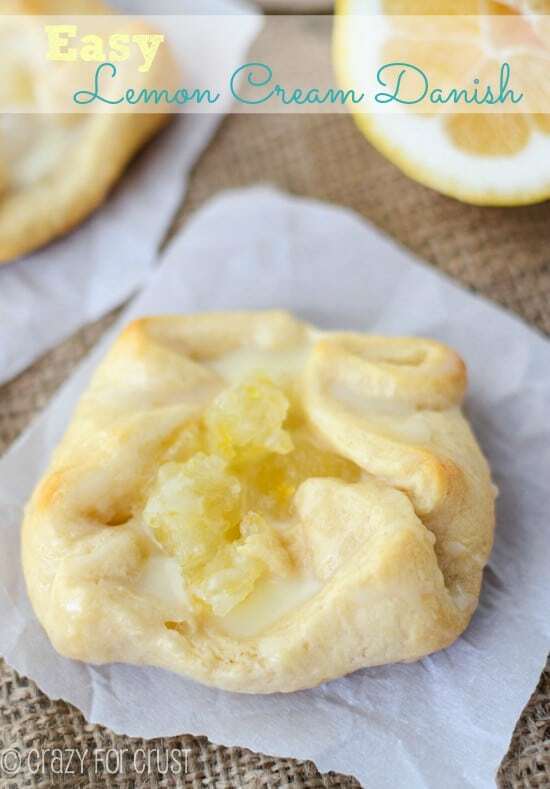 This Lemon Cream Danish is made easy with Crescent Rolls! These look delicious and I love how easy they are to make. hey girl- oh my word! these are right up my alley! yummy! What does this look like? I can’t visualize what this step looks like. You open a can of biscuits, you have the unrisen, round biscuits. How do you unroll them? Sorry… probably a really dumb question, but I just come up with it on my own. 🙂 . You have flattered me with this extraordinary biscuit bomb chocolate recipe. The pictures says how alluring this is. I would love to have a bite of this. 5 ingredients……… Is only 2? Is this like 35 is the new 60? A zero is a 4? Oy Vey!? Will this work with the frozen prebake grands from freezer section? They’re so much better than the refrigerator case pop cans of grands biscuts.